This is An Article. It Contains Deadpool and Advertising Advice. What More Do You Need? Hey you. Yes, you! The one with the colorful shirt and the beautiful eyes? If you’re reading this then you probably chose to because I mentioned Deadpool in the title, right? Well, what about me, you know, your narrator—I’m fun too! Nah, nah, I’m joshing you. Why do you think I put Deadpool in the title? Because I knew if you like Deadpool, you might read it. I mean, I like Deadpool. I haven’t seen the film yet, but I trust Rottentomatoes.com and last I checked they gave it an 81%. And I think that’s rad. And if you think that’s rad—then you might also like fourth wall breaking jokes. “What’s a fourth wall breaking joke?” I hear you ask. Okay, I don’t actually hear you ask that, because I’m a collection of squiggles on your computer screen that manages to communicate intricate thought, that someone in the past bothered to put down on paper, but you get my point. Fourth wall breaks, what are they? Well, they’re what I’m doing right now. It’s when I totally acknowledge the actual facts of a piece of media. Like if I’m in a movie and I act like I know I’m in a movie. Or when a character in a book addresses the reader. That’s breaking the fourth wall. And the reason for this term is interesting—no! Wait! Don’t walk away! I promise this will entertain if you don’t already know. It comes from theater, because on a stage there’s three walls, that bind the actors into the scene, but there’s also the open part of the stage that you the audience is looking through. At least, assuming Wikipedia isn’t lying to me. So, you see, right? I know you see, you’re smart. I like you, reader. I feel like you and I have some sort of thing going on here, a friendship. A blooming one? No? Alright, more chimichangas for me. Anyhow, reader. 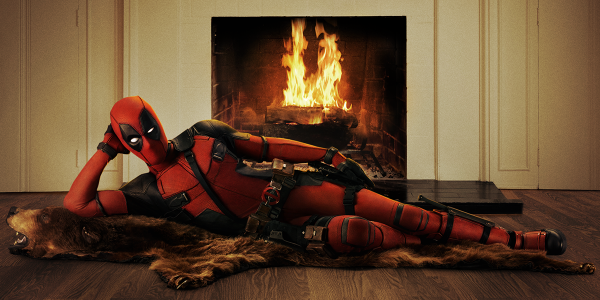 The trailers for Deadpool utilize this for marketing and advertising all over the place. Like all over the place. Have you seen the promotional poster when you’re in line at the theater in Countryside Mall? The gag even works with paper printouts, for gosh darn sake. But he’s not the only one who can use this, come on! Anyone can have a little fun and a little benefit from fully letting their silliness out and dripping it into the 3D past the restrictions of flat screens, print papers, and radio ads. Have a little fun with your advertising. People really do respond to a little levity. There’s enough dry and dull things in this world as it is. Don’t add to that, be a little more like Deadpool…without all the murdering, and the swearing, and the other nasty things. Because I don’t endorse that part. So… yeah, give it a try. And I’ll see you later if you decide to read this article again.